Fantasy Flight Games, be'Jesus, please announce a release date. ALSO ... Check out our other Spoiler and Preview Articles for Convergence! Amanda Reynolds aka JediGeekGirl and her co-host Sarah Evans, who recently took down a Regionals (CONGRATS!! ), released three spoilers and also did a full podcast dedicated to the discussion of them. I'm lucky to get mentioned in the podcast as well ... or should I say my smooth European-style voice is mentioned! THANKS guys! I Rebel - A Star Wars Destiny Podcast is an amazing resource for the Destiny community, so be sure to check out their website, which amongst other things have the most comprehensive compilation of data from the various Regionals across the world available. 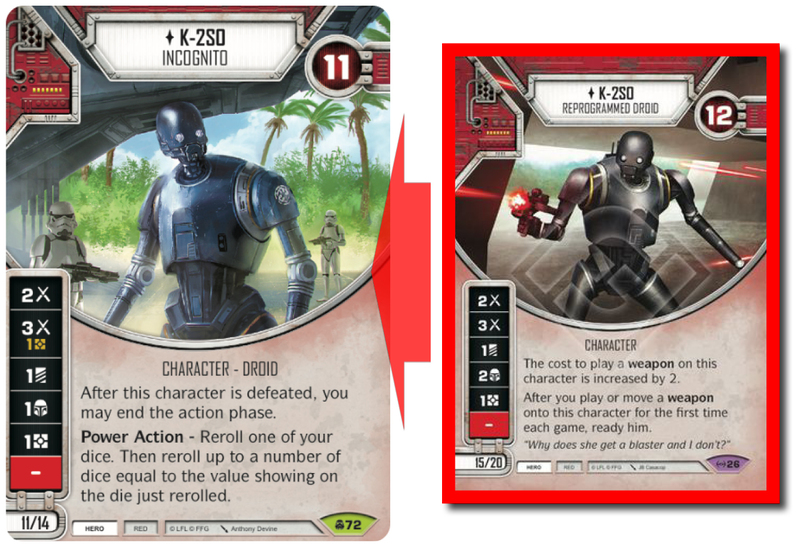 The card that got most people excited was probably the long due upgrade to the previously unplayable K-2S0. Obviously the reduction in points cost was vital to K-2S0, with the previous 15/20e being so prohibitive that he saw NO PLAY at all. Probably one of the worst characters printed. His die is obviously significantly weakened, while the 3 Melee for 1 Resource side looks particular suspicious. His die is in fact pretty weak even for a 11/14e character and he'd probably receive more love had he boasted two 2 Melee sides instead. He's obviously going to be on the lookout for a blue Melee partner and Kit Fisto seems to fit that bill excellently, although that means having both characters with paysides. Not sure that's the best. Maybe Luke Skywalker - Reluctant Instructor is actually the stronger choice here or some funky Yoda deck, if you want to go 2wide, although the arguments for bringing K-2S0 over any of the other blue hero characters are few and far in between. An honorable mention should also go to the new Mace Windu, who would also slot in nicely with K-2S0. 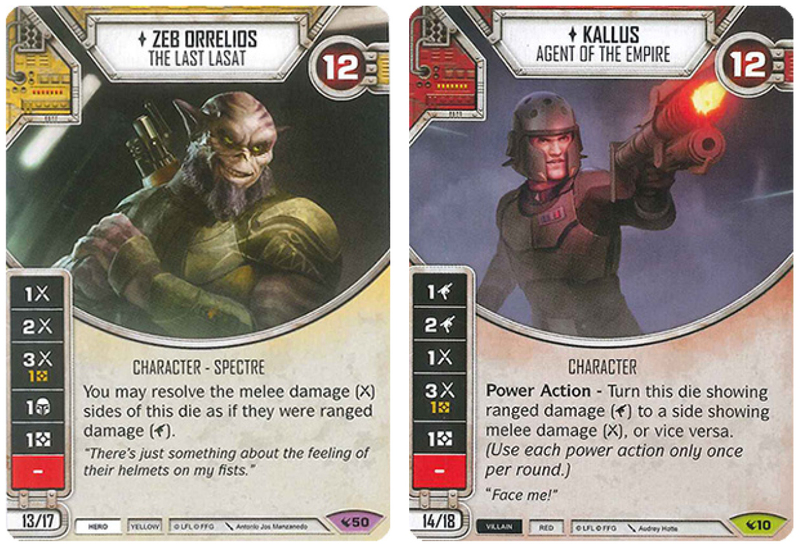 K-2S0's Power Action is pretty interesting and it allows you to reroll both your own and your's opponent's dice. If you hit the 3 Melee side it's like an improved Triple Threat. His ability to end the action phase after being defeated is interesting - in particular against Indirect damage. If your opponent is resolving multiple dice with Indirect damage and the first die defeats K-2S0 the rest are potentially wasted, and it makes sequencing a bit more tricky. It's of course a one-time thing, but could still make for some interesting strategies in a game. K-2S0's ability is of course meant to supplement the new event HONORABLE SACRIFICE. Apart from the fact that Honorable Sacrifice reference one of the greatest scenes from Rogue One, the combination of the two cards act as a cheap Hyperspace Jump although you have to sacrifice K-2S0 in the process. If you can generate the right conditions it's ok, but you'll need to argue pretty hard to convince me that it, apart from fringe cases, should be superior to Into the Garbage Chute!! What excited me the most though was the A-WING! I knew that a new 2cost hero vehicle was in the books since the T-47 Airspeeder is due to rotate out of Standard Format. And I'm somewhat conflicted here. 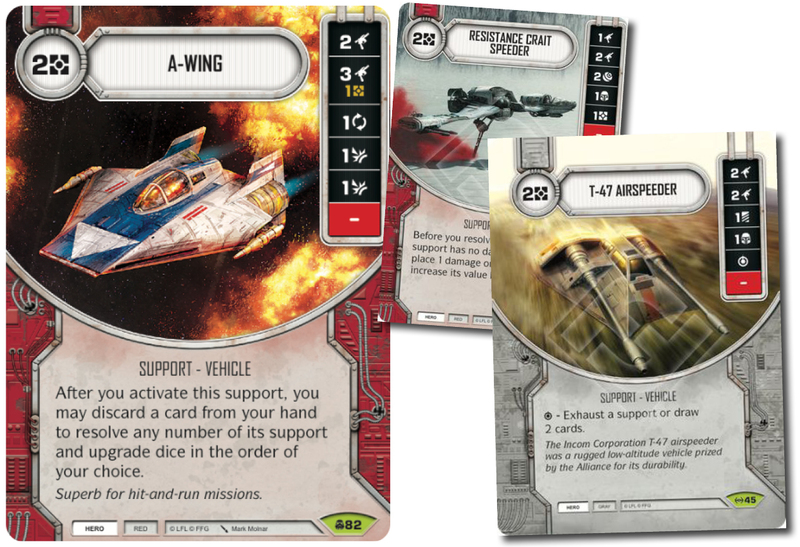 The A-WING was always going to have a tough time upon arrival replacing one of the best 2costs supports available as well as competing with the Resistance Crait Speeder which is a magnificent support piece. It does disappoint though, and although the after ability is cute, you are probably unlikely to stack a 2cost support with Triple Laser Turrets and other mod upgrade shenanigans. The die is ultimately the killing blow though as the two Disrupt sides are really and eye sore. Compare it to the T-47 Airspeeder and you realise that the A-Wing is like an expensive mistress that doesn't offer the reliability of the wife that always had your back! That's going to be an ugly divorce. The Knights of Ren also received three spoilers and released a patreon podcast where they discuss the spoilers, and the hype for ENFYS NEST was real (she was spoiled on the Display boxes of Convergence). Let's start with the obvious ... The artwork on ENFYS NEST ... IS AWESOME ... as in really really AWESOME! Oh my Gaaaawd. Beautiful! Seeing the die sides on Enfys Nest though can cause a heart attack until you read the text on the card. And then it makes (more) sense. With the Power Action available you can resolve her matching dice sides for free, which means she has a 2 Resource side, which is pretty awesome! She definitely feels like an upgrade from comparable characters like Zeb Orrelios and Kallus. The question is if the 14/18e is too high and too prohibitive, but on the other hand, you really don't want to make Enfys Nest too compatible with Yoda, which could be pretty terrifying, although not good enough to go with Bitter Rivalry. She fits well with a number of characters, but the two pairings I'm most hooked on trying out is Aayla Secura for heroes and Mother Talzin for villains. 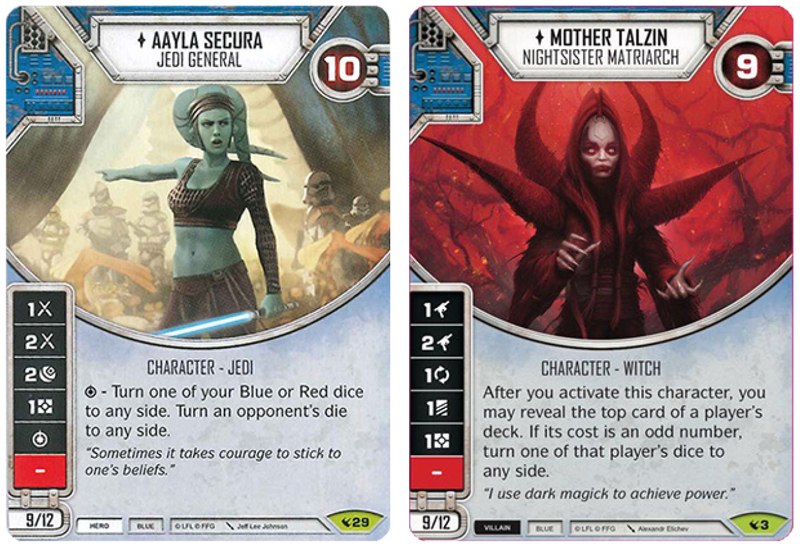 Being able to add the consistency of either character looks pretty awesome, even if Aayla's Special doesn't work on Enfys Nest's dice, and I'm kinda relishing the possibility of adding Easy Pickings to a Mother Talzin deck courtesy of Enfys Nest's ability! 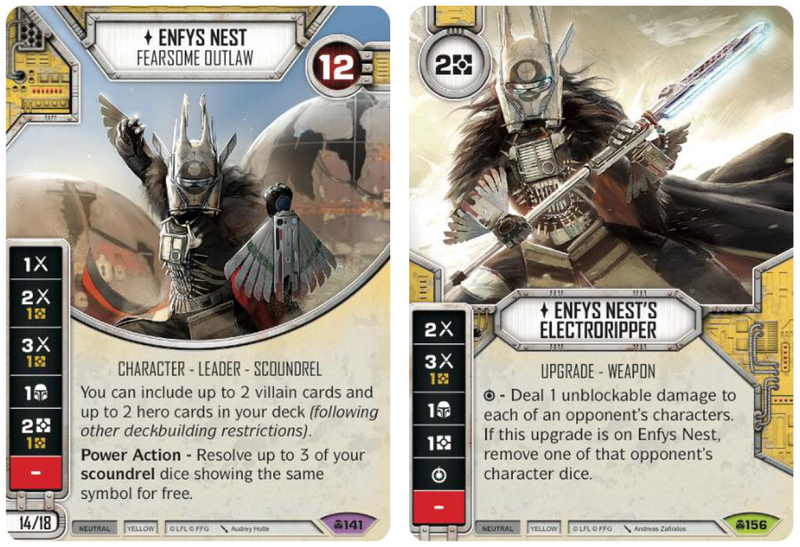 ENFYS NEST'S ELECTRORIPPER also looks pretty cool! Unfortunately the 3 Melee side cannot be resolved using Enfys' Power Action, but it's just a 2cost weapon after all. The Special is mediocre, but good when attached to Enfys Nest. Free mitigation? Yes, please! 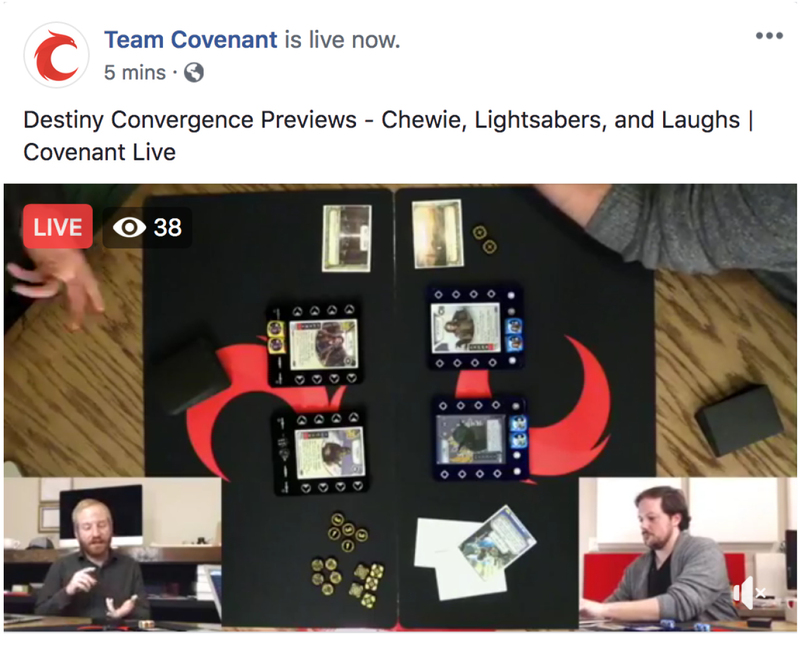 TEAM COVENANT went all in on their spoilers and made a livestreaming event playing two decks including 7 (SEVEN) brand new and previously unspoiled cards from Convergence. Even though the event aired pretty late at night in Denmark I was still glued to the screen. I loved the format and although Zach Bunn and "the-other-guy-who's-name-I-can-never-remember" (sorry) ... wait, is it Steven? ... played deliberately SLOOOOOW, it was entertaining and a brilliant platform for spoiling cards! THX guys! We knew that we were going to see new blue ability upgrades and finally have the veil lifted on the new "UPGRADE - ABILITY - FORM" as well as the "EVENT - MOVES" (all images are screen captures from the livestream so are a bit low on quality). (SPECIAL): Remove a die showing damage and give a character 1 shield. (SPECIAL): Choose an opponent's character and force them to activate it. Then you may resolve one of their dice as it it were in your pool. (SPECIAL): Give a character 2 shields. You may discard this upgrade to play a card titled Soresu Mastery from your hand or discardpile on attached character for free. All three upgrades look pretty good, and FORCE PULL in particular could be incredibly good. It puts loads of pressure on your opponent to get his characters activated and obviously looks the best on Yoda, although in a meta without Force Speeds it might not be as broken as first imagined. Being able to resolve an opponent's character dice as if it was your own is pretty awesome and screams anti-Vader tech. SORESU MASTERY looks expensive, and although Qui-Gon Jinn is going to love, in particular partnering up with Yoda, then 3 resources is still a fair bit. The Special though is pretty awesome. SORESU TRAINING is an odd card. It has weak dice sides even when counting in the Special. The question is if the discounted ability of the Sith Holocron is worth the effort? I'm still in doubt as to how many "Soresu Mastery" cards we'll see and how powerful they'll be? The quality of Soresu Training will definitely depend on the availability of those cards. 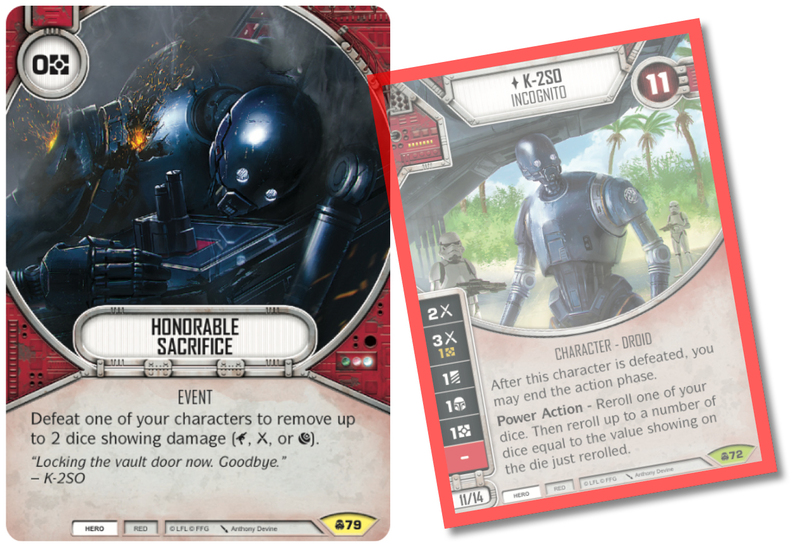 Finally, we got to see two of the new "EVENT - MOVE" that was previously advertised with the spoilers of the plot LIGHTSABER MASTERY that adds a new level to deckbuilding similar to Premonitions, but infinitely better! The plot is really strong at 2 points. Not only are you adding two cards to your deck for a total of 32 cards, but you are also making them invulnerable to mill from your hand, which is incredibly strong in itself. You effectively play with 6 cards and dependent on what other "Event - Move" we are going to see spoiled or in future sets, you can compose your hand in a yet unprecedented way. I'm honestly pretty impressed with the plot and think it's one of the strongest cards I've seen so far in Convergence. Activate one of your Blue characters to remove a die showing ranged or indirect damage (symbols). If that character has a card titled Soresu Mastery on it, give it 2 shields. Resolve one of your character dice as if it were showing a shield (symbol). If that character has a card titled Soresu Mastery on it, that die is resolved without removing it from the pool. Deflecting Slash is a reworked Deflect and although you don't get the damage swing from the latter, you get a superior effect to Guardian, because you don't take the damage, remove a die and if you have a Soresu Mastery card attached also gain two shields. It's an incredible piece of mitigation which could go a long way to fill the gap left by Guard and Overconfidence. Circle of Shelter or the Conehead's Circle as I will be calling it is pretty good with Luke Skywalker - Reluctant Instructor as long as he has a Soresu Mastery ability on him. Luke's ability then allows him to resolve any character die side as a Melee side and leave the die in the pool. It's not broken by any means, but simply replaces Synchronicity as you 0cost damage out of hand event. 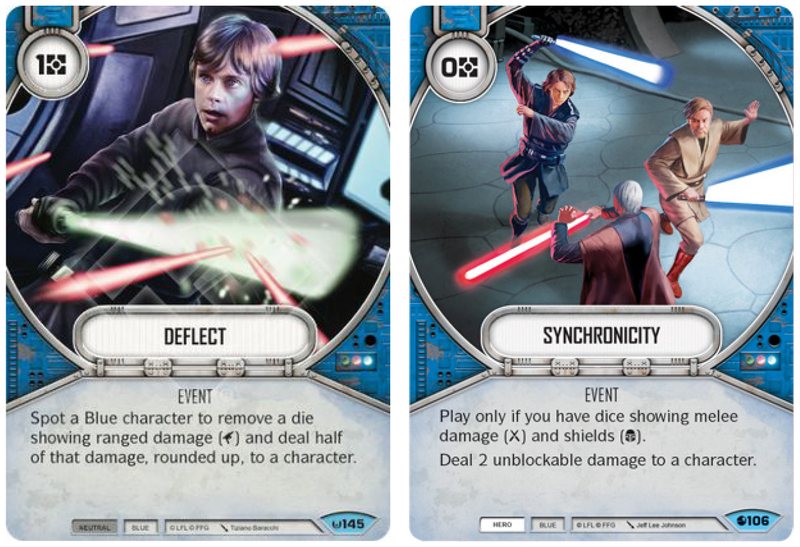 There seems to be a great deal of love coming for blue heroes and in particular cards that support Luke Skywalker and Qui-Gon Jinn. Shields is a thing and so will shield hate be! It's going to be interesting to see how characters like Obi-Wan Kenobi (from the new Starter Set) and Mace Windu are going to fare in a set that seems to emphasise force abilities and shields over Melee damage. 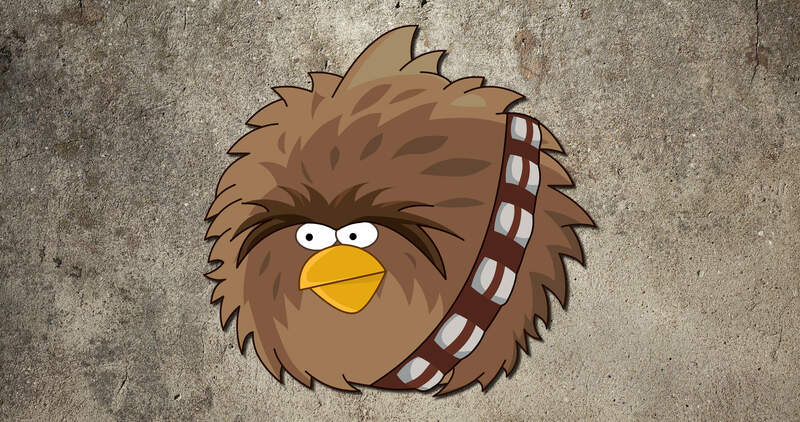 Obviously everyone were eager to see the new Chewbacca and prior to the streamed event we only knew that he would be 13hp. Which isn't bad for starters. And that was it. At first I misread the card and thought that the "increase its value by 1" was all symbols showing on his character dice, which would have been bonkers, but realising that it was damage sides made me calm down again. Guardian is just not as strong as it was in the infancy of the game when Nick Obee of the Artificery crew wrecked face with his ePhasma/FO/Enforcer deck. The attempt to make Guardian worth it by boosting Chewie's dice when he has 6 or more damage on him just doesn't seem to suffice, and does NOT make up for an incredible weak dice on a 12/15e character. Chewbacca is definitely underwhelming, although he will probably see play outside of competitive settings due to the affectionate nature of Destiny players. That's all though. You'd need some pretty crazy die sides in play, value of 3+, for Reap the Reward to become much more than a versatile Logistics. If you have ways of boosting the value of your dice, i.e. similar to QGJ2's ability, there might be some gain in it, but for it to be good you'd need to be able to net 2 resources, which very few character or upgrade dice facilitates. Activate one of your Yellow vehicles and up to 2 of your scoundrels. You may remove one of your dice showing a resource (symbol) to ready that vehicle. I didn't want to leave my own gang out of this spoiler article, so here's the spoilers YOUR Destiny received! 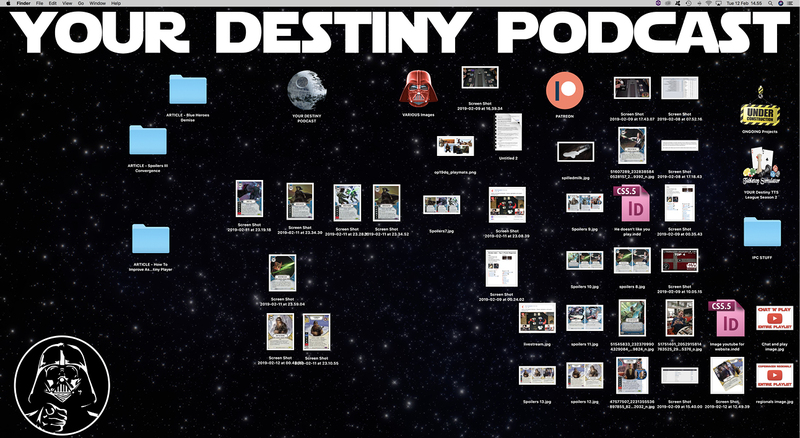 Well ... it's actually just a screenshot of my desktop while working on this article ... because we didn't receive any spoilers. Hey ... no more #SPOILERGATE! Just couldn't resist teasing!